On May 3rd, JDC junior journalists visited Sam Seoung Heul to interview people who were touring there. Sam Seong Heul is where the myth that the three first names in jeju, Go, Yang, Bu was formed, existed. Because it was the first day of the 4 straight holiday, there were few people enjoying their Saturday in Sam Seoung Heul.Junior journalists interviewed people about Jeju island becoming an international city. They interviewed about 4 people who visited Sam Seoung Heul. One female named Fanny accepted their interview request. 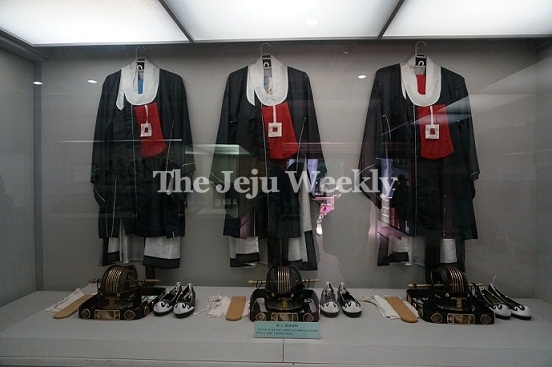 She said “I like it because it preserves some of the old things.” She thought that people should use media like movies to use Sam Seoung Heul to connect with Jeju becoming an international city. They also interviewed one male business man. He said “Jeju island is a very thankful tourist attraction to Korea.” He also mentioned that he had greatful memories each time he visited Jeju island. He said international city is to attract foreign companies more easily so Jeju island should be a comfortable place to forgieners. And one female kindergarten employee was interviewed and she was new to Sam Seoung Heul. She said apprizing about Jeju to people is crucial making Jeju into a international city. Jeju is a place which is designated Biosphere Reserve in 2002, World Natural Heritage in 2007 and Global Geopark in 2010. Like this, Jeju is well-known for it’s natural beauty. But if you take a look closer, you can find these historic sites a lot. And they attract a lot of tourists. Actually, Jeju become a main tourism point for Chinese people. According to these examples, Jeju becoming an international city might help people know about Jeju island much more too.